The DW 9002 Double Bass Drum Pedal is the industry standard when it comes to kick drum pedals. Used by amateurs and professionals alike, it.. The DW 9002 Double Bass Drum Pedal is the industry standard when it comes to kick drum pedals. Used by amateurs and professionals alike, it’s well known for its superb blend of speed, power and feel. It’s packed full with clever features for superb versatility and brilliant functionality. The DW 9000 Series of bass drum pedals is well known as an industry standard. Popular because of its effective playing feel and superb balance of power and speed, the 9000 bass drum pedal remains the top choice for many drummers of various musical styles. The DW 9002 pedal is fitted with an infinitely adjustable cam which allows easy switching between accelerator and turbo sprocket styles, as well as settings anywhere in between. Just to recap, the accelerator setting has a lighter feeling at the beginning of each stroke that becomes heavier as the beater approaches the batter head. The stroke literally accelerates into its hit. The result with the accelerator feel is a bass drum sound that’s much more attacking with harder, more powerful hits. The turbo option on the other hand maintains a consistent feel throughout the pedal stroke. The pedal stroke feels the same throughout the beater movement. This setting, therefore, provides more control and consistency. This level of adjustments means you have every option you’ll need no matter what style or genre of music you’re playing. Need a powerful impact? Select the accelerator. Want a more controlled sound? Opt for the turbo. Or if you want a blend of both, position the cam somewhere in between. You have a plethora of options when it comes to the feel of the DW 9002 bass drum pedal. 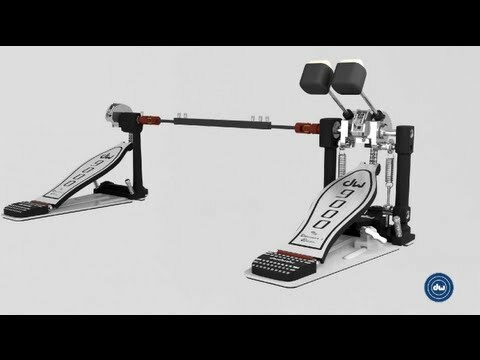 The 9000 Series Double Bass Drum Pedal also features DW’s floating rotor drive system which offers a smooth, consistent, comfortable playing feel. The swivel spring also increases efficiency on the down and return stroke providing less resistance for added smoothness of feel. If you want a silky smooth response from your bass drum pedal, the 9002 will give you just that. 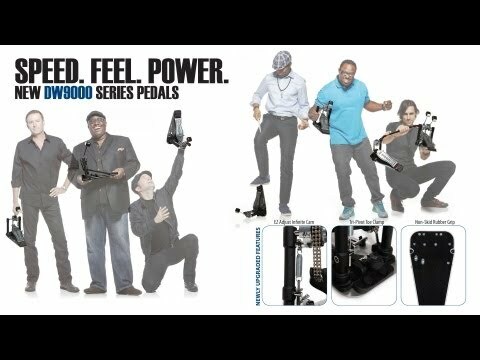 The 9002 double bass pedal features some new additions to its design. One of which is the tri-pivot toe clamp which serves to ensure the pedal and bass drum hoop stay connected and protected no matter what the bass drum size or angle. It offers a consistent secure link between the pedal and the bass drum to ensure a comfortable playing position that will stay in place once set. Another new addition to the 9000 series pedal is the non-slip rubber grip on the bottom of the base plate. This was installed to increased stability and to create a stronger connection between the drummer and the bass drum. There’s nothing worse than your bass drum pedal constantly moving or sliding out of place after you’ve positioned it. With the toe clamp and the non-slip rubber base, the 9002 double pedal will remain in place no matter how vigorously you play. The DW 9002 Double Bass Drum Pedal features a single post casting which allows the pedal to be tucked close up to the hi-hat pedal. This allows for ease of movement between the kick pedal and the hi-hat, again creating a comfortable feel to optimise your playing. The single post casting also enables the pedal to be played independently or simultaneously with the hi-hat pedal depending on what your needs are. The 9002 double pedal post that connects the two pedals is crafted from aircraft grade aluminium that has been precision ground, heat treated and honed to create the strongest, most robust double pedal rod. It also features a memory lock to aid fast, precise set up for a consistent playing position every time. The DW 9002 comes with a chain driven set up as standard but has a nylon strap included so that it can be easily converted to strap drive. Again Drum Workshop are providing you with various options that allow you to change your feel, playing style and ultimately your sound, quickly and easily. This bass drum pedal features a state of the art patented ball bearing hinge to offer a smooth footboard movement with each stroke you make. Another nifty feature of the 9002 bass drum pedal is that it has a convenient clip on the base plate that holds an included DW drum key. It’s well known that drummers regularly lose their drum keys. Having one clipped to your bass drum pedal ensure your key is nearby when you need it most. A clever little addition to a pedal already packed out with functionality. As standard, this DW bass drum pedal comes fitted with an SM101 two-way bass drum beater which features a plastic side and a felt side. Maintaining the theme of providing you with options this bass beater gives you the choice of the attacking, impactful tone of the hard plastic beater or a softer, smoother attack from the felt side. As if DW hadn’t crammed this pedal with enough features, they’re even giving you a bag to put it all in. The 9002 double bass pedal comes with an included nylon carry case which allows you to easily store and conveniently transport your pedal. It’s clear to see why this bass drum pedal is the industry standard. The DW 9000 series bass drum pedal is well loved because of its smooth feel, range of flexible choices and robust aesthetic. If you want a double bass drum pedal that gives you options the DW 900XF has plenty to offer. From its infinitely adjustable cam, included nylon strap drive option and two-way beater, this pedal has a range of choices within one multifunctional design. With its unmistakable feel, playability and artist-approved features, it’s easy to see why this is the top choice for a wide range of drummers. Offering flexibility and versatility, this is a superb double bass drum pedal. Buy yours now from PMT Online.